Looking at the photograph for the first time one can get the feeling that something is not quite right here. Indeed, something is very particular in Picasso’s sleeping. Is it really sleep, or something more or something other than sleeping? Picasso is, as if, embracing himself with his left arm and right hand (the one he will soon be using again holding and directing the brushes. He is, as if, covering, enveloping himself to distance himself from the world where his alive body is temporarily settled in the bed. 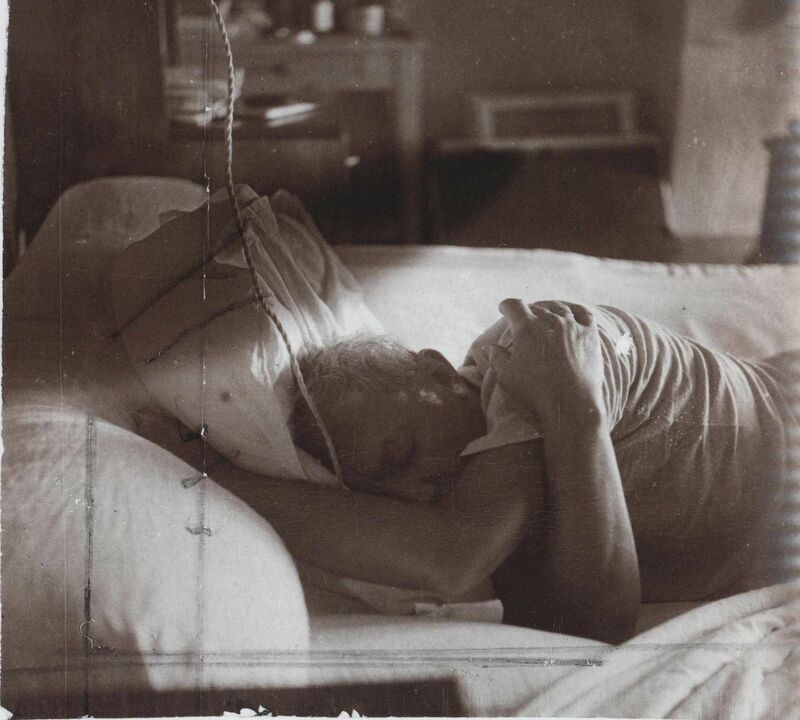 The contrast between the light and dark areas of Picasso’s body, the bed and the air of the room hints that the topic here is not the fact that Picasso is sleeping because it’s time to sleep – to rest, to accumulate energy in order to continue his spirited life and creative work (or that it’s already morning and time to get up, etc.) The point here is rather that the contrast between light and darkness together with the intensity of his posture suggest that something is very particular about his non-presence while sleeping. Take the contrasted area of the pillow brightness right around Picasso’s head drowned in the darkness (we’ll see what this contrast means – what the artist is up to – later, in his works, or his fingers, as if playing melodies on his left shoulder (on the way from the effect of light to visual music expressed on the canvass). Picasso’s face is covered by a “self-sustaining” shade – not a naturalistic shadow projected by, let’s say, the angle of the window cover or something. It’s the shade of his “sleeping distance” from us regular people and from our monotonous world and rudimentary imagination. While he is sleeping his soul is not resting nor hypnotized by the events of the world or high or delirious. It’s wondering in different worlds. It’s not only the mysterious darkness of his face separates him from us, but the light which warms his body and intensifies his back, shoulder and right hand. While sleeping he is, as if, charging his imagination by the alternative but… universal knowledge about the “bizarre” lives which will later become visible in his creative works. Sleeping Picasso is much farther from this world than we, regular sleepers and dreamers just resting from the despotic concreteness of our lives revenging us in our sleep by the images of exaggerated fears or hypertrophied happiness, until the next morning with its habitual routine when non-freedom and entertaining boredom return and pleasures again will be severely taxed by the limitations of our organic stupidity. But in his works Picasso who during his sleep is charged with alive otherness will address us with the vitality of his creative gift to carve life more real and exuberant than our every-days and holidays, our flying-ups and our falls. For Dora Maar’s Picasso to sleep it means to acquaint his mind and soul with creative innovations of perception and reactions, feelings and love. Picasso as an artist is alertly opened to the present mixed with its past and future in their common organic limitations. It makes him a really democratic type of personality. For him hysterical innovations are much more dangerous than human limitations without sparkles of intolerance to otherness. In the same time there is no conservative routine in his artistic style with the highest coefficient of transformative dynamism. In his work he, as if, personifies the sublimated democracy in action – able to carefully modify itself in appearance and essence. His artistic style is always realistically oriented – is always semantically pursuing objective reality provable even when it seems exaggeratedly exotic. Take just a tiny fraction of his artistic achievements – portraits of Dora Maar. His numerous paintings of her – are endless modifications of her face and body and her facial expressions and moods without modifying her soul or distorting her appearance – you can always recognize her face and facial expressions in spite of their transformations. Like she in her photograph “Picasso’s sleeping” immortalized psychology of his creative personality as a part of the Grand-Master’s mystic, he immortalized her in her very being. The experience of mutual immortalization! What can be more glorious result of personal love?